To start monetizing and promoting your app with ironSource, you will need to add your app on the ironSource dashboard. First, log in to your ironSource dashboard. Then navigate to the Apps tab on the left sidebar. There you will see a ‘New App‘ button on the upper right. 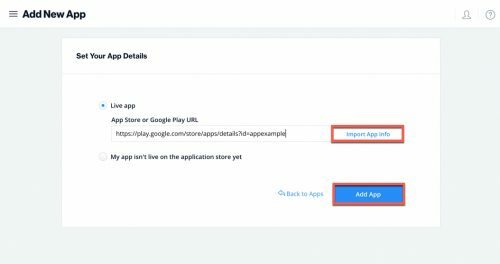 If your app is live in the App Store or on Google Play, enter your app’s URL as it appears in the App Store or Google Play and click ‘Import App Info‘. 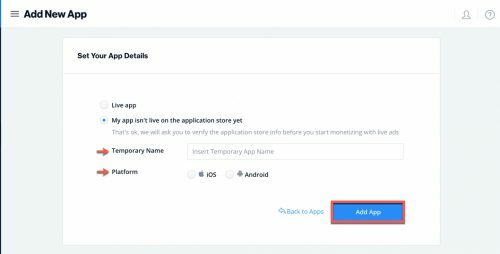 If your app isn’t live yet, simply enter a temporary app name and define the platform. Then select ‘Add App‘. You should then be redirected to the below window with a success message. Note: Your app will now appear on the Applications Management page in the Apps tab. This page provides an overview of all your apps, their platform, monetization ad units and user acquisition campaigns. Integrate the ironSource SDK to gain full access to our product suite including mediation. Monetize your app! Integrate our ad units: Rewarded Video, Offerwall, Interstitial and access premium ad inventory through our Mediation platform. Promote your app! Reach ideal users with our user acquisition campaigns.